Tom Killion, Point Reyes from Chimney Rock, 2011. Woodblock print. Courtesy of the artist. My orchestral tone poem Point Reyes from Chimney Rock takes its title and inspiration from a woodblock print (above) by contemporary artist Tom Killion. This work reflects on a coastal landscape in Point Reyes National Seashore in the San Francisco Bay Area (where I was born and raised). It was commissioned by the NYU Symphony and premiered at the Skirball Center for the Performing Arts in New York City on March 3, 2014. In the following reflection, I share some of what went into the creation this piece. My intention is certainly not to dictate how to listen to my music—you are free to form your own conclusions and derive your own meaning from it!—but to hopefully illuminate the compositional process, both for laypeople and for other composers who may be interested in how I approached writing music inspired by a landscape. …the simultaneous invigoration and comfort of the sweeping drama of the sea cliffs against vast sky and ocean, alongside the intimate, delicate beauty of wildflowers and grasses. 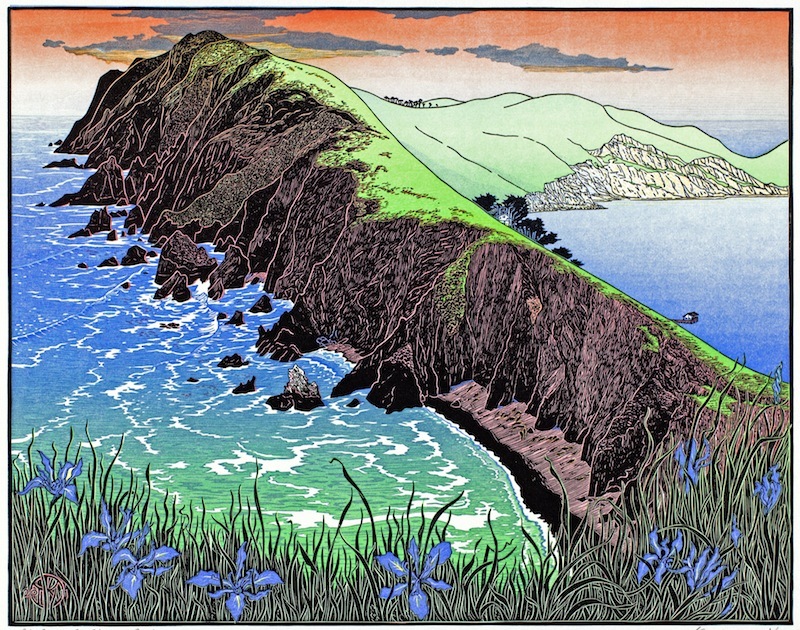 Killion’s stunning woodblock print (pictured above), which I am fortunate enough to own a copy of, depicts a view of Point Reyes, the peninsula jutting into the ocean north of San Francisco, from which the rugged Pacific can be seen on one side of the rocky, grass-frosted peninsula, and Drake’s Bay on the other. This artwork acted as a focal point for the aspects of the landscape that I sought to evoke in my music. It’s perhaps worth noting that, at the time I acquired the print and composed this piece, I had never actually been on the Chimney Rock trail in the bright, spring weather depicted in the print; only foggy summer, when the grass is dry and brown and the iris blooms are long gone. However, the print strongly evoked for me the feeling of being in other, similar locations in Point Reyes and the Marin Headlands. And, as we will see, the mood of my music ended up relating to this landscape in both types of weather and seasonal conditions. March 2014. Photo by Nell Shaw Cohen. August 2014. Photo by Nell Shaw Cohen. My initiating concept for Point Reyes from Chimney Rock was that, through my music, I wanted to convey the qualities of the landscape I feel are captured most powerfully in this print, and which I relate to most strongly from my own experiences in this landscape: the simultaneous invigoration and comfort of the sweeping drama of the sea cliffs against vast sky and ocean, alongside the intimate, delicate beauty of wildflowers and grasses. The question, then, was: How to translate these characteristics into a musical experience? I’ve tried to musically represent and perhaps even guide the wandering of one’s gaze across an image or a scenic view. Music is a medium inextricably linked with time, on many levels: from the level of rhythms and note durations, to the overall pace and proportion of change in the music as a whole (the latter being, in my experience, one of the most difficult things to objectively perceive and perfect while composing a piece). One of the most interesting challenges of composing music inspired by images or experiences in places that exist independently of time (unlike film, for example), is the attempt to turn those inspirations into a temporal experience. In some ways, I’ve tried to musically represent and perhaps even guide the gradual wandering of one’s gaze across an image or a scenic view. Different sections or elements of the music are, during the compositional process, envisioned as responses to different areas of the image and place. All audio excerpts are from a live recording by the NYU Symphony. I chose a full orchestration for this section, utilizing all of the players in the orchestra simultaneously, to convey the power and scale of this image and concept. The major harmonies and broad, filled-in registration—from the timpani and basses up through to the piccolo—were intended to evoke the crisp colors and clarity of light of the Northern California coast on a sunny spring day. Next, I wanted to explore the juxtaposition of this view against the more intimate elements of the landscape, represented in Killion’s print by wild irises. (This aspect of the image perhaps most drew me to it in the first place; as a viewer, this foreground element makes me feel like I’m “inside” the space of the picture, peering outwards.) This juxtaposition of macro and micro landscape features is something that I’ve been drawn back to repeatedly, and which I began exploring with my first-ever orchestral composition, which was inspired by Georgia O’Keeffe’s paintings. 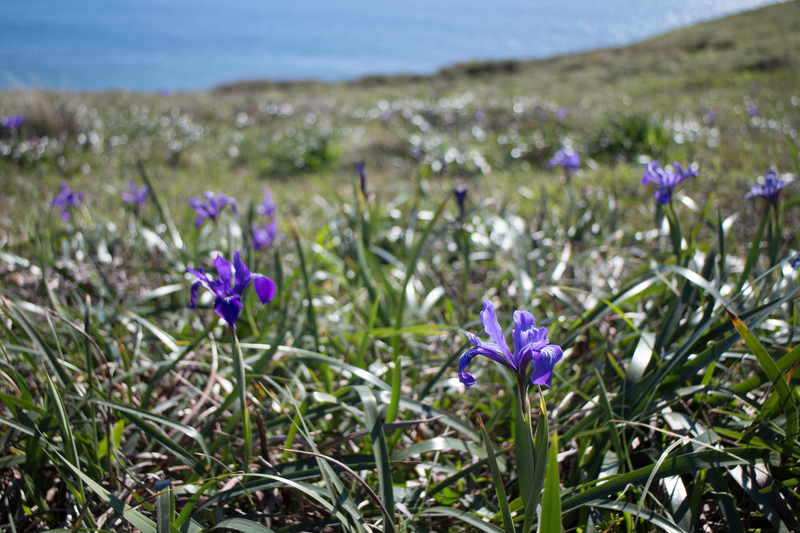 Wild irises at Chimney Rock. Photo by Nell Shaw Cohen. Additionally, I wanted my music to contain some of the visceral sensation of being in this place, beyond its purely visual aspects. 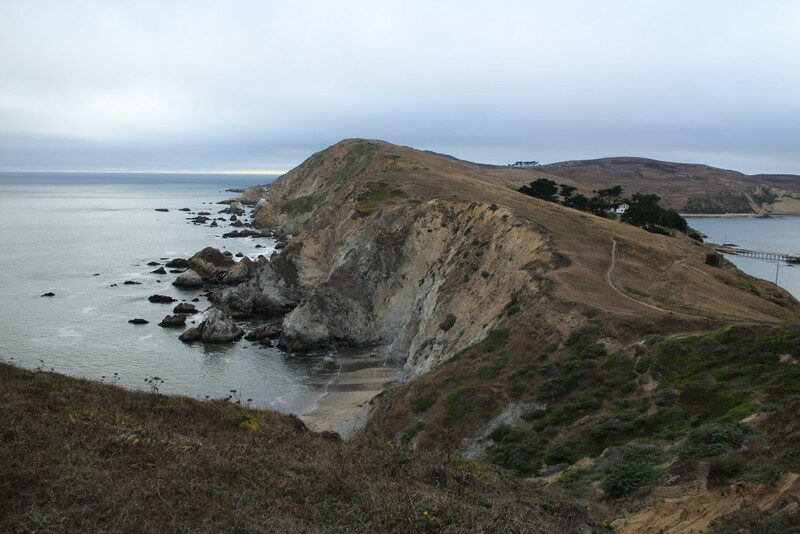 In particular, when I composed the second section of the piece I was thinking about the cool, sweeping coastal winds that one typically encounters in this area (which can be alternatively soothing and overwhelming), as well as the sensation of walking steadily on the trail. Once I began working with all of these ideas that emerged before and during the process of writing the music, new musical material emerged that was not envisioned in direct response to either the print or the landscape. Those things acted as initiating prompts, setting the tone and direction of the piece. However, whenever working with “extramusical” source material I’ve always found I need to set those concerns aside for long stretches of work and focus purely on following the internal logic of the musical ideas—attempting to flesh these ideas out into a fully-formed expression. …there should be a kind of “DNA” in a composition that suffuses every line or texture and makes it belong the world of that piece. That said, if I am successful, there should be a kind of “DNA” in a composition that suffuses every line or texture and makes it belong the world of that piece. And so, ultimately, all of the music in some sense derives from those first responses to the source material. When I was reflecting on my work while finishing up the piece, I realized that this latter part came not out of any specific feature of the landscape itself, but rather the way it makes me feel. There’s a mix of celebration and yearning—a sense of searching for something lost and precious—that I was striving to capture with this music. It may be seen as an expression of my perspective as someone who, for various reasons, spends most of her time in New York (approximately 10 months of the year), but is perpetually homesick for the coast of California! Please feel free to ask questions or add comments below. Would you like to read more deconstructions of the compositional process for other works? Let me know. I’d like to acknowledge Herschel Garfein, who was my studio teacher at the time I was writing Point Reyes from Chimney Rock and provided me with guidance during its development. 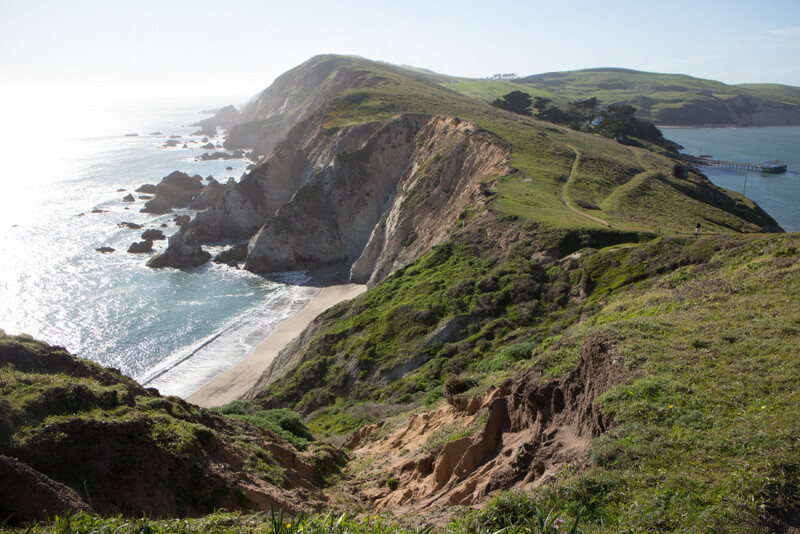 Learn more about Point Reyes National Seashore or the artwork of Tom Killion. This entry was posted in essays and tagged creative process, landscape art, reflection by Nell Shaw Cohen. Bookmark the permalink.